Dullish emulation of a cool PDP-11 front panel hack. No one can stop the Alien Bill invasion! Kinetic gravity study...click, hold, and release to launch balls into the fray. Fishtanks are my way of learning new graphical toolkits. A styish 60-second timer for board games...no more waiting for the clock to run out! Swarms of all 7 critter types from Imagic's Atari 2600 "Cosmic Ark". Snarky political potshot, a proof of concept of a photo/word stencil tool. Artsier piece about a caught moment. Tool to better see an amazing optical illusion switcharoo. Roulette for science fiction story elements. Exploration toy for Jessica Hagy's cleverness. A font made of 2x2 grids of blocks and triangles. Ducks. Lots of ducks. A virtual plane full of an infinite number of graphpaper ducks. Ephemeral sculptures made by projecting generations of John Conway's 2D Life in 3D. A graph of sunrise, sunset, and twilight throughout a year. A.K. Dewdney's "Wallpaper" algorithm from "The New Turing Omnibus". Not 100% original but 100% charming, a robot army derived from the ASCIIBotics lab factory. A small castle building program - I was thinking "Zaxxon" but it came out all "Crystal Castles". An implementation of a timepiece that came to me in a dream. Possibly inspired by the Wii Virtual Console throbber. A browser port of the program below, for my Aunt on her birthday -- blood in variable widths, and ink, for cathartic doodling. Experimental font I ended up using for my Advent Calendar. Trivial little Action Painting simulation program. The same, tinted for Amber. Worms of paint that learn and repeat the pattern you draw. An interactive tribute to Sol LeWitt's Wall Drawing 797. A failed toy. Click to draw. A riff on the book "10 PRINT CHR$(205.5+RND(1));:GOTO 10"
A touch-screen friendly remake of the most existential game ever. Drag the boulder up the hill or die trying. A study and recreation-ish tribute of the animated elevator walls from the movie "Her"
Based on Tadashi Tokieda's excellent numberphile video, a toy for see how random, regular, and triangle patterns interact at different scales, rotations, and translations. So the site Glorious Trainwrecks announced The Emergency 100-In-1 Klik And Play Pirate Kart Meltdown. My first five entries were in processing/java, and each was done in two hours, give or take. My first post-100-in-1. 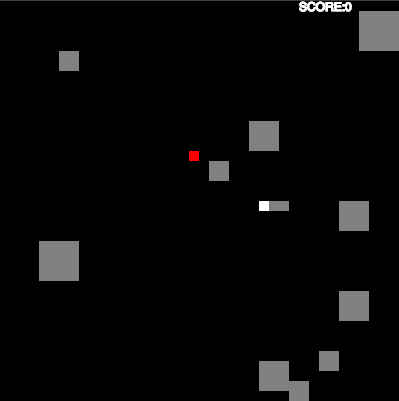 It's an action game set in Conway's Game of Life. My first processing with sound! Drag your draggin to eat the villagers who are threatening you and your apples. A slightly spruced up version of my Holiday KotM... also my virtual greeting card that year! My nerdiest trainwreck! Type the words that are sounded out before they destroy the planet or whatever. the springy yoyo / bashes the three sticky frogs / send them to heaven! Physics-y target game... see the first basho for cultural context. These are beautiful, ephemeral pixies, flitting about hither and yon on gossamer wings, creatures of virutal light and logic, the very stuff dreams are made of. You smash them with a rock. You are the beardy manspider. Throw your springy webstrands to catch rides from the green leaf pods and catch flies for health and points! Not yet fleshed out into a full game, now it's more of a one-button pretty splashing bees with water simulator. My 2008 Virtual Christmas Card started as a Glorious Trainwreck - slingshot the snowmen! Uses 2D cel shaded graphics. Another bit of a disappointment, 3D Table Tennis for Two turned into an odd sketing program. Another sketching program made during the MIT Mystery Hunt, ported by memory from a Palm program I made back in the day. More of a dorky simulation than a game, RGB particles "swarm" and laser it out. The physicsy "joy of smashing" game. A rough idea for a 3D Joustpong turned into yet another insect-ish control scheme game. You guide, and possibly destroy, beautiful patterns of swirling rainbow invaders. As Six said "feel like a riot cop firing into a group of people who are staging a demonstration about how much they love pretty colours." You're a single member of the mighty red ant army as they go to battle against the fearsome black ant army, each side crawling over the corpses of its fallen warriors to wage battle. A computer/human collaboration tool/toy to help you make love poems, based on a markov chain analysis of the love blender poems of 2008. A noisy toy. Didn't quite come together like I hoped it would. A Halloween Jack O'Lantern Construction Kit. An experiemnt with a very nice visual effect I ran into. Ever notice that most space ship physics games ignore rotational inertia? This little time trial shows you why they do that. Odd physics-based head-to-head game, gather 10 blocks to your side before your opponent. Bees are after your precious diamond... smash them! But-- for everyone that falls, 2 will take its place. A relatively successful little physics game. Kaboom! in reverse... you're the Mad Bomber what drops the bombs the computer has to catch. Before there was Dorkicus, there was...Rocket Dorkicus. Same game, but with rockets. This time, your a gun bearing bee, defending your land from the horrendous spiders. Speed and aim both play a part. Pilot a bumbling bee around a track - race against a ghost of your previous best attempt! Attempt to port a classic Apple/PC game in 2 hours... be a paratroopa shoota! 2-player physics-y homage to the old board(ish) game "Crossfire", knock pieces into your opponent's goal. My previous attempt to make something pretty... now in 3D! A play off of Amber's favorite oldschool Arcade game, but in 360 form. A small halloween-themed toy, mostly fun as a visual design exercise. A failed attempt to capture some of the glory of Crossroads. My Christmas Card for 2010. A curvier version of an old cellphone standby. You are a fire fighting hose! Do your job! Pretty little dodge 'em game. (GDC Pirate Kart) Warm up game for the Pirate Kart, how fast can you shave? (GDC Pirate Kart) Fun game of daring and minelaying! (GDC Pirate Kart) The world's finest, or first, dino boxing bees simulation. Inspired by What People Think Game Jammers Do, I decided Pac-Pong had to exist. Not a bad little game, actually! A 3-fold response to Anna Anthropy's book "Rise of the Videogame Zinesters"
A challenging, kinetic, quick hit (because of the difficulty) invaders game. As a game, combining RTS-style controls to dispatch fleets of autonomous fighters against a field of rocks doesn't really work. At Glorious Trainwrecks they found it does work as an art piece, however. 6 art toys. Click to interact, space tends to clear the last one you've played with. Old "make all the stars disappear" puzzle"
A functional virtual prototype of a watch that tells you the time more like a person would. A port and variant of a tic-tac-toe-ish game from COMPUTE! 's Gazette.